Riannon, a former cockfighting breeder hen who landed at the Hayward Animal Shelter, couldn’t wait to open a new chapter of her life at the sanctuary in October 2011. 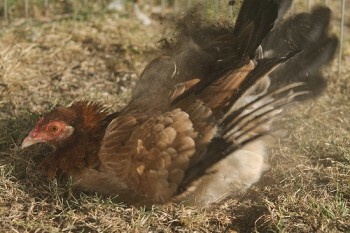 Within minutes of touching down on Stockton soil for the first time, she got busy with a good old-fashioned dustbath while several sanctuary roosters sounded off with welcoming crows from afar. We caught a quick action shot of her mid-bath.